The incredibly giddy search engine Yahoo! has just been revamped, ladies and gents of the web. [firstpara] In a rather ambitious move, given the current rise of mobile surfing (thanks of course to iPhone), Yahoo! Inc. attempts to bring the best of the web in one single page—across PC and mobile phones. It seems Yahoo! has been influenced by that little known social networking site Facebook. In one word: applications. Yahoo! wants their users to make their respective Yahoo! homepages the gateway page to the rest of the triple W.
The way Yahoo! does that is by allowing them to add applications from anywhere in the world wide web into their Yahoo homepage. In short: You can access everything from there. 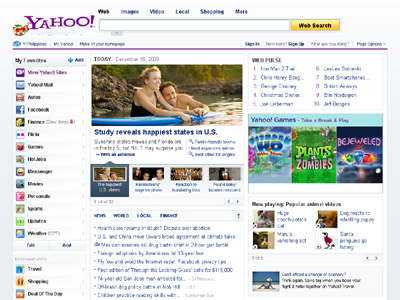 Here are the six new features you must remember about the new Yahoo! 1. Do your Favorites. There is a dashboard of more than 38 apps that you can directly add to your homepage. Among those are—what else?— networking sites. With your favorites neatly tucked in a corner, you should be able to do an organized rollcall of websites that you visit everyday. Don’t forget to put FHM.com.ph in the first slot. 2. Make your own App. Thanks to technology developed by Yahoo!, users can easily create their own application by adding any URL of your choice. Calling creatives and bored people alike! Now’s your chance! 3. Set and/or follow Trends. No need to crawl all over the www. Yahoo! serves snapshots of the current internet trends. You’ll now be privy on what people are searching for, the most popular stories, etc. Mighty helpful for business-minded people looking for the next big thing. 4. Relevant news and nothing more. You can toggle the news module at the top of the page for access to the most relevant of news. Because, really, do you care about the weather in, uh, Nebraska when you’re based in Upper Cainta Lower Antipolo aka UCLA? 5. Status Updates. Another influence of Facebook: Users can share their status right from the homepage, see the status of your friends, and integrate them with all those social networking. 6. Be in Sync. It’s still to come but soon, you can sync your PC to your mobile for a seamless on-the-go Yahoo! experience.